I met D.N. Raju known as Darby Raju to friends in 2011. He is an acoustic engineer from I.I.Sc. Bangalore and specialised in noise control. He took me to his under-construction winery and shared his vision to make it a wine destination. He was slightly perturbed despite being generally cool. He had been supplying premier quality Shiraz and Sauvignon Blanc to Grover but due to their quality problems, the supply-payment cycle had been disrupted. He hoped that normalcy would return but realised too much dependence on one customer could be dangerous and decided to create and promote his own wine label Soma. 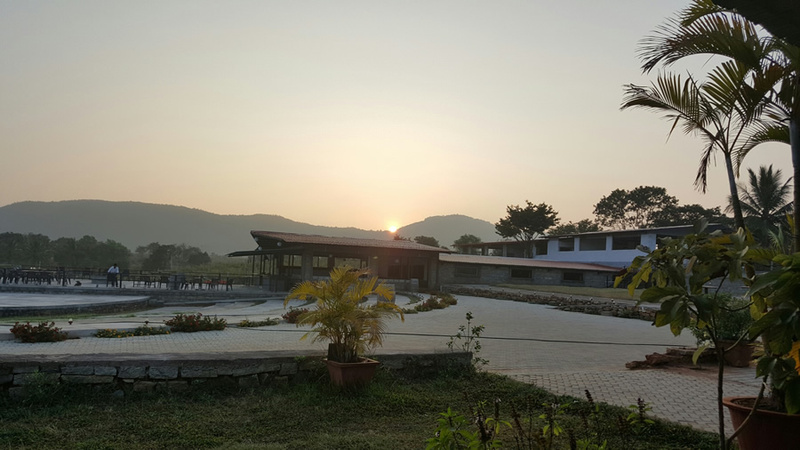 Normalcy returned at Grover but he decided to maintain his independent identity and exploit the uniqueness of his vineyards with several fruit trees including 550 coconut palm, custard apple, mahogany, teak and mango trees making it a unique vineyard. 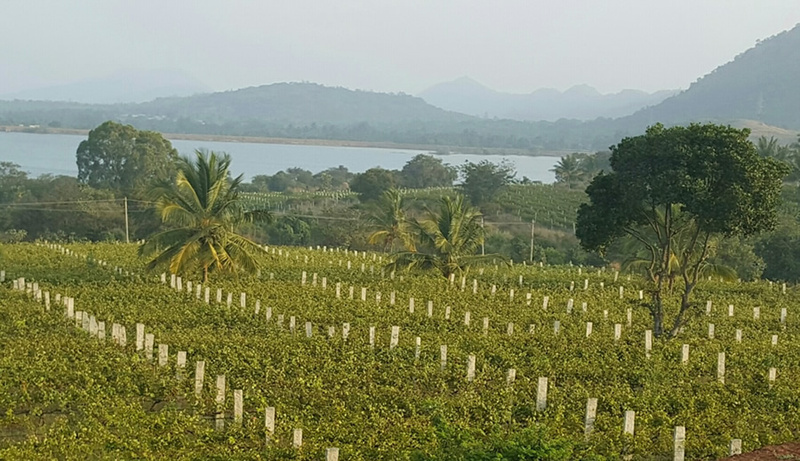 The breathtaking surrounding view around his vineyards, merely 35 kms from the new Bangalore airport and less than 20 kms from Grover Vineyard, makes it an excellent wine tourist destination. He continues to supply 80% of his grapes to Grover, but decided to complete the boutique winery a couple of years ago in partnership with Sri Lanka- based Paul Topping, Chairman of the Alpha groups specialising in duty free goods. 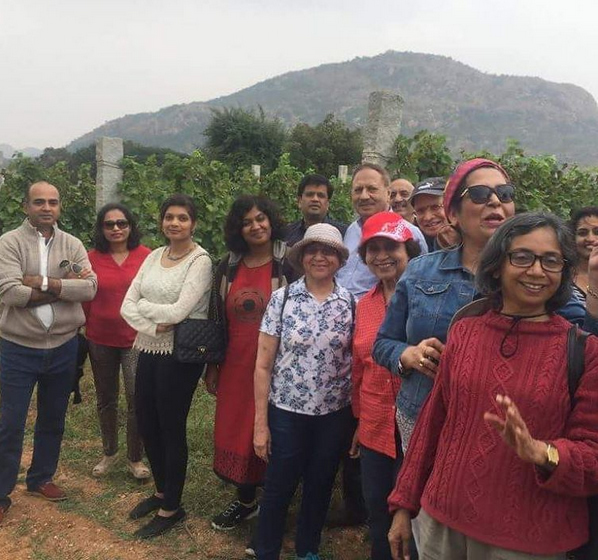 He was eying the lucrative wine tourism, keeping the ecological balance not only as a philosophy of his vineyards but also exploiting it as a USP for visitors. When Darby told me that the Bangalore Wine Club was organising a Soiree at the Vineyard on the Full moon night on Saturday, the 22nd of January and invited me to come, it was the right moment for a second visit to taste his wines and check out the progress of his wine tourism project. During the last 2-3 years, there had apparently been several interesting events and the venue was very popular with the expats, CEOs, the IT techies and wine lover groups, I was told. This was a visit I will always cherish. The aplomb with which he organised the trip and the enthusiasm shown by BWC members and the guests was truly infectious. A simple lunch prepared by a village woman was preceded and followed by unlimited amounts of coconut water and cream. A guided visit to the vineyard was organised with the all-rounder viticulturist Roshan, with a stopover for Sauvignon Blanc 2012 which was surprisingly fresh, crisp and fruity but with a bitter underlying flavour. The visit ended on the top deck of the winery, known as Sunset deck where Shiraz Rose 2013 quenched the thirst of parched throats. The barbeque dinner with the full-moon dancing through the clouds and a lovely band from Goa yearning for attention, was accompanied by Shiraz Solo (which implies 100% Shiraz) followed by Kumala Chardonnay, Shiraz and Pinotage. The bonhomie and the bonding of the club members was enviable and not usually seen at gatherings of such groups in Delhi. If wine helps make friends, this was a perfect evening to experience the adage. 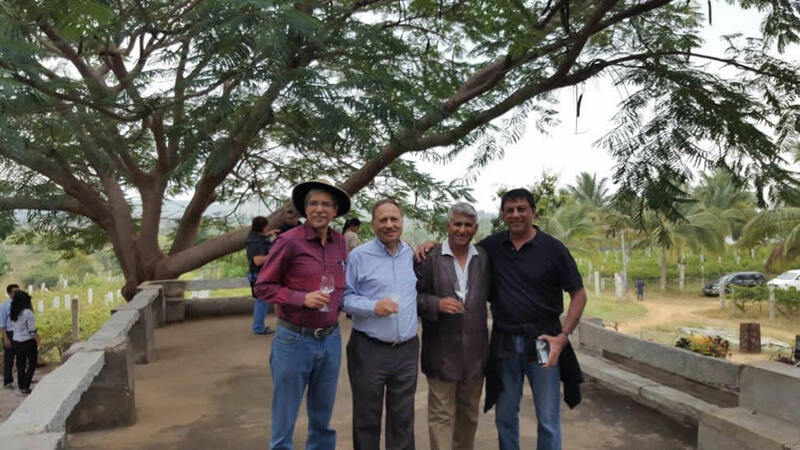 As Aslam Gafoor, the current President of BWC , who holds office till March, explained, the club has been regularly coming to the vineyard at least once a year. Maureen Kerleau, a British lady living in France had lived in Bangalore for a couple of years. As President of the Expat club she had been to the vineyard a few times and was ecstatic about the time they spent there. 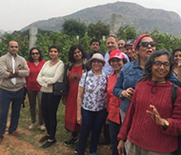 Raju calls the organised visits to the vineyard experiential-the visitors get a unique experience in a pollution- free atmosphere with breath-taking 360˚ views from several vantage points. His next phase will see several individual cottages built on the lake front and other strategic spots on the vineyard, each guaranteed to offer at least a 270˚ view. Several spots including the terrace of the 3 bed-room refurbished cottage he calls ‘Heritage House’, offer a stunning 360˚ views of the vineyard, winery and a big man-made reservoir-now referred to as the lake. 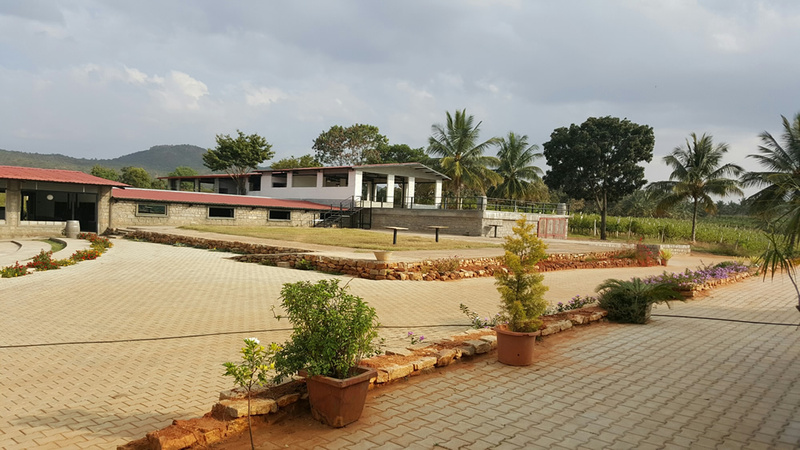 Facing every nook and corner of the property are the towering (relative to the 150 m height at which the winery is located) beautiful Maakli hills. One can spend hours hill-gazing and wondering how Tipu Sultan, the ruler in the late 18th century, could have built a fort on top, which is now dilapidated but still visited by trekkers daily. He used it as a stash for armaments including the world famous Swords of Tipu Sultan that never rusted due to a special alloy made in the village which used to exist where the property is situated, according to Raju. Darby bought the estate in 1980 but did not convert into vineyards till 2001. He had been in the floriculture business during this period, growing and exporting roses in collaboration with a Dutch company. He candidly concedes that it was the Bordeaux wine consultant Michel Rolland assisting Grover since the beginning, who inspired him to set up the vineyards. ‘He was so impressed with the terroir and the location that he told me it will become a golden wine tourism venue in years to come.’ He offered that Grover would buy all his grapes-provided he ripped off all the fruit trees and grow grapes instead. Already working with ‘permaculture’ (somewhat akin to organic farming), he refused. Michel relented and he has been supplying premium grapes ever since to Grover, with a small gap of 2-3 years in-between when he supplied to Sula for their leased winery in Karnataka. Shiraz has unique flavours of coconut, black pepper skin and a faint smell of aromatic roots because of fruit trees, claims Darby. Sauvignon Blanc vines have been planted along the cooler north-east lakeside slopes and offer crisp and lemony fruity flavours to the wines. Raju owns 120 acres of land with about half planted with Shiraz (75%) and Sauvignon Blanc (25%), 80% of which are sold to Grover. The farming is non-certified organic. 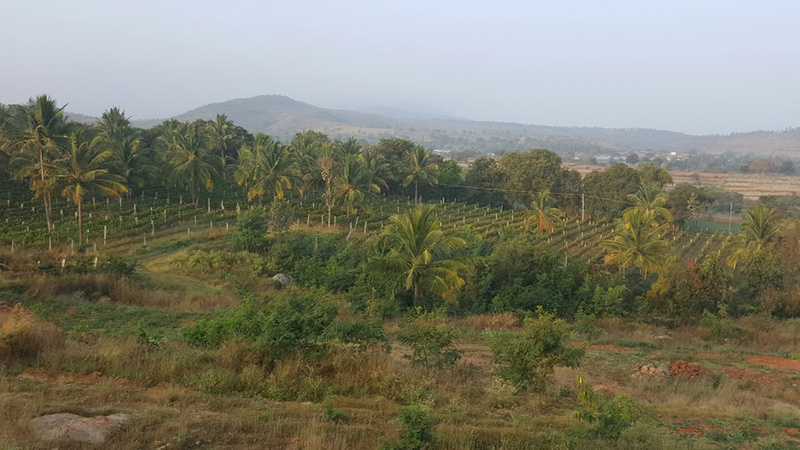 Water from with neem and custard apple tree leaves (both grow on the property and thus help maintain ecological balance) is sprayed everyday by a posse of 20 permanent employees who stay in different parts of the vineyard and are provided food. Copper sulphate is also used but minimally. This year has been very traumatic because of heavy rains during the flowering period, destroying most of the red wine crop. Although there is a bumper crop expected in Sauvignon Blanc but only from the flowers that were saved as the flowering period being early had taken place before the vineyards were lashed with rains. 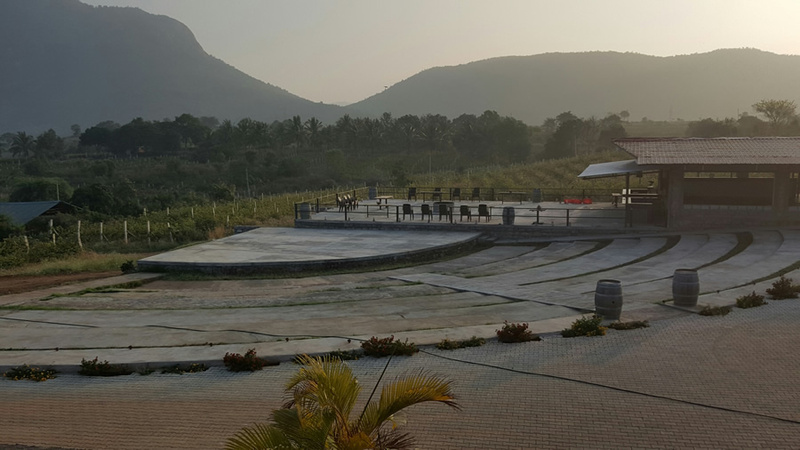 Bangalore Soma Vineyards bring you the sounds of silence with plenty of planned activities, none of which involve any sound during the daytime. You are away from TV and Wi-Fi. Every visit is pre-planned in the city office in Bangalore. At least for the time being, only one client is entertained every day-it could be from 2 to 200 or more for weddings. The venue has increasingly becoming popular for weddings, mehndi functions , birthday and engagement parties- with several engagement dinners having been held already. Car launches like Volvo, awarding the buyers of Jaguars an experiential evening for a couple who buys the Jag–starting with the vineyard visit, tasting of 3 wines- White, Rose (Shiraz) and Red served at different points during the vineyard visit. 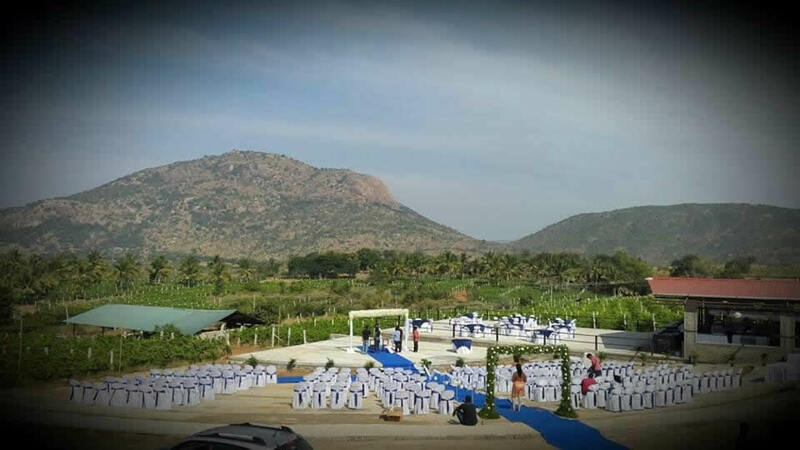 You may be only 2 people celebrating your wedding anniversary and in a mood to be totally romantic or over 200 at a big fat wedding (like 250 people attended one of the Hindujas recently ), you can be sure there would be no other outsiders enjoying the vineyard experience. I told Darby, it was a bit too luxurious for a couple paying Rs.10,000 and having the place all to themselves for the day-enjoying 3 wines and a complete wine dinner for 2 set exclusively for them. He may change the policy in future for economic reasons but right now he says he wants to give the most memorable experience to anyone who comes. It is a great option for a couple or a bunch of friends that could be 3 or even 70, like the members of the Bangalore Wine Club. You can be quite sure the visit will be a private affair-away from the noise and pollution of the city with only the sounds of vines breaking the silence. But on the other hand on December 31, there was a group of 75 revellers that booked the entire place. Once there were 60 techies who were catered to and given mattresses from his stocks of 100! They were all accommodated within the complex and comfortably, according to Raju-of course without 5-star comforts. He does have French tents for a rainy day (pun intended). One can enjoy a full moon-lit night or gaze at the stars with an astronomy expert; one such event saw around 200 people congregate to watch the stars with a telescope. He plans to use the 750- person amphitheatre to hold musical soirees for mature audiences listening to classical music or jazz. Darby claims it to be India’s first underground gravity-flow based winery though at least Chateau d’Ori already has had one for several years. It has gravity based drip watering system due to height difference of around 40 m from the ridge- mounted main water storage tank and the vineyard’s lowest point. Vines have been planted along contours, against the slopes to prevent topsoil erosion. There is no chemical weedicides and pesticides to prevent contamination of the lake. 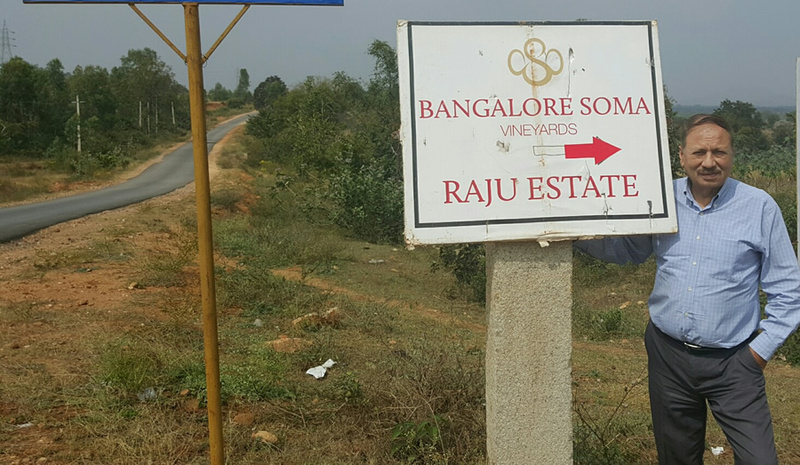 Bangalore Soma Vineyards is well on its way to become an excellent wine destination with several unique features. It will also likely be counted as a boutique winery with sales from its cellar door.